If it still to this day surprises me, it’s got to be surprising to you too: Fruit leather is so Lebanese. I was eating fruit leather long before I’d ever heard that term, and even before we were buying fruit roll-ups at Schmidt’s on Lansing’s west side way back when. 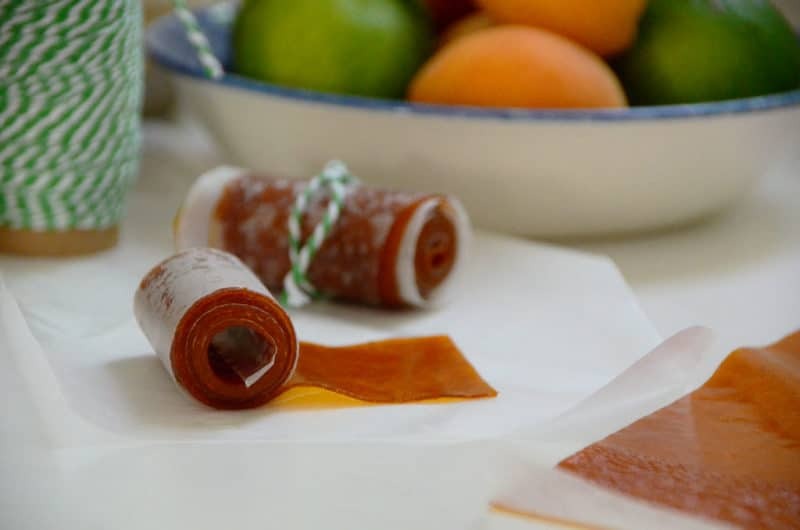 The original Lebanese version of fruit leather is a thicker, sticky apricot paste folded like a letter and wrapped in orange cellophane. It’s called amerdeen (um-er-DEEN; also qamardeen and qamar el edeen), it tastes of super-concentrated dried apricots, and at home we always considered it a treat of a day when the orange package showed up on the kitchen counter for us to tear into. The first summer I launched this site, I was asked about how to make fruit leather, and I haven’t gotten it out of my mind ever since. Now that I’ve done it and discovered how simple it is to transform pretty much any fruit into leather with a process akin to making preserves, I can’t wait to go after any and every fruit with the leather in mind. This isn’t just approval-because-we-love-you, either. These kids are seriously nuanced with their food; my 11-year-old nephew dubbed the apricot leather a ‘paste’ without ever having heard of amerdeen, and he asked me all kinds of questions about how the leather is made, nodding in approval at the addition of lime to balance the sweet and add a tart element. 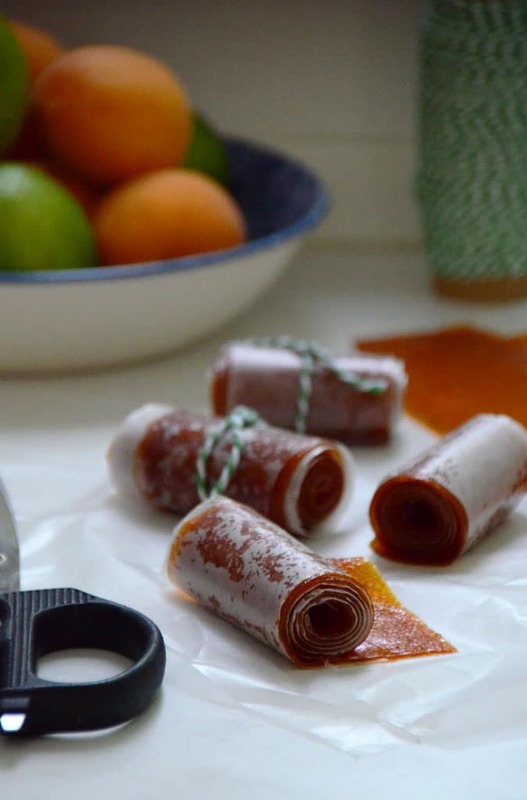 Maureenie’s apricot fruit leather is real-deal Lebanese, and real-deal delicious. And since it’s not for sale (yet), you’re going to want to make some for yourself to discover your own resounding kid-approval, and to see just how good homemade fruit leather can be. Homemade fruit leather is very easy to make, and a great way to use up your abundance of ripe summer fruit. Use this recipe to make leather with most any fruit you like. 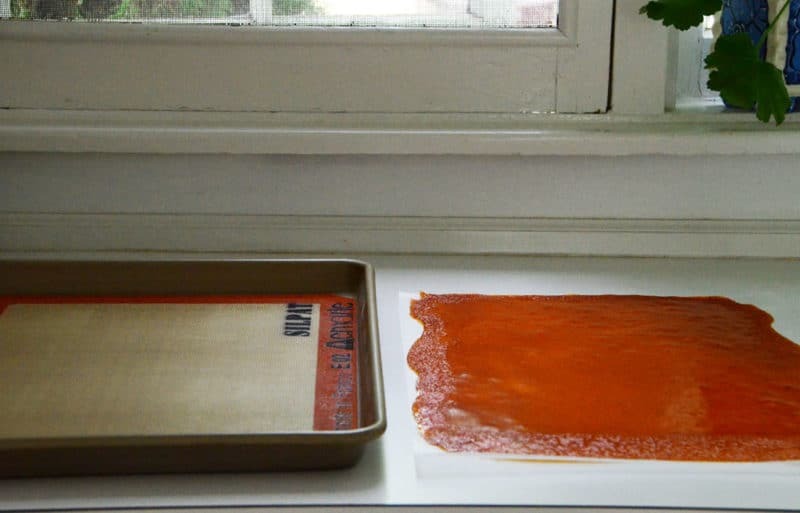 A Silpat will release the fruit leather with the most ease, but parchment paper can be used instead to line the pan. For thicker leather, double the recipe using the same size sheet pan, and double the baking time. Makes one half sheet pan (18”x13”) of leather. Line a heavy duty sheet pan (18”x13”) with a Silpat or parchment paper. Place a rack in the middle position of the oven, and turn on the oven to the lowest setting, about 140-170˚F. 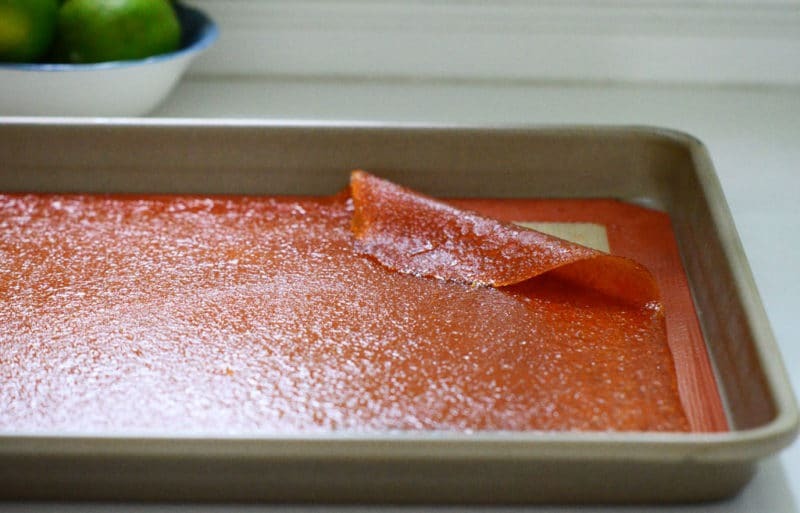 30 Responses to "Homemade Apricot-Lime Fruit Leather"
Wow, I’m delighted to see this. 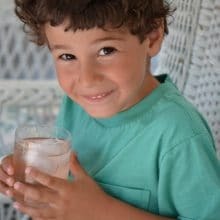 I spent several years in Beirut as a child and loved amerdeen (or mush-mush as the kids called it) beyond measure. No other fruit leather (so far) has been a patch on it, so I’ll look forward to trying this! I also like the sound of those candies…Thanks so much! Isn’t that the truth??? 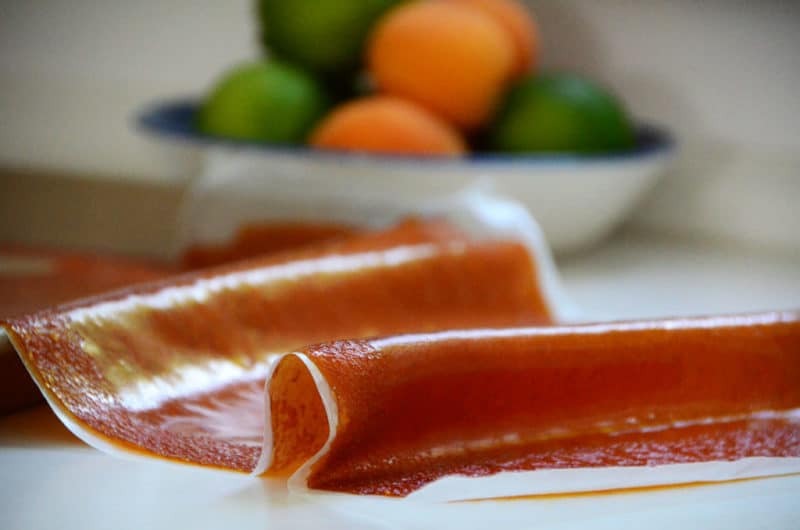 Apricot Fruit Leather and Laban…..both were in our Sito’s kitchen and fridge looooog before they became Americas staple food. If we knew then what we knew now, we’d be rich Maureen.. lol! Love having the recipe for the leather. I always buy mine….now I will make it. Laban on the other hand, is always in my fridge. Thanks for another exciting new recipe for me to try. Super thank you. Always loved the apricot rolls and have been wondering how they are made. Did not know they could be made at home. What is the shelf life (in the fridge) Maureen? Thanks Karine! This will hold for at least a week. Who needs kids to try it when it sounds so good. I’ve tried making fruit leather with a cheap-y food dehydrator in the past; it never worked. Excited to try this method. But…so sad all the apricots are gone here! just this morning, my girls (10 & 7) asked me to buy fruit roll-up for their snacks. i told them we would make it instead so your recipe is ever so timely. off to buy a silpat! appreciate the tips! Amerdeen! Oh I completely forgot about apricot leather–my Aunt Louise (born in Lebanon) always made it–we all loved it–oh my gosh, the memories you bring back–thank you! My brother’s eyes still light up when I bring home the apricot leather from the Syrian bakery. I can’t wait to try this recipe! Do you think it can be made with dried apricots? My goodness–your blackberry buns sure look cozy under that blanket of soft powdered sugar. Sorta like winter in July. 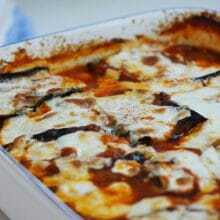 I’m clipping this recipe to try when I have some free time. I’ve never baked with lavender before and am very curious how it will be. Sounds and looks heavenly, though. Thanks, Maureen. Hi, I wonder if I can do this with dried apricots. I live in the uk and the apricots I boughts on several occasions ar very sour and hard- they come from Europe not as good as the ones back in the Middle East. I lov reading your blog! Hi Zainab, and thank you! I have not tried this with dried fruit but you could, taking more time to soften the dried fruit and probably using more water to create a puree. But you might be surprised how even hard, sour apricots take on fabulous flavor cooked with sugar/agave (and perhaps little or no lime, if very sour). Those are well worth a try! I can’t wait to try this recipe. My dad used to bring Apricot “Paper” home from trips to Florida when we were kids. It was so much better than anything you can find today. Thanks! I’m gonna make this in my dehydrator today! Looking forward to trying this recipe, just a quick question- most of the syrian dried apricot paste I buy at the Middle Eastern stores list “Olive Oil” as the last ingredient. Any idea where that plays into the Syrian recipe? Shukran! Hi Susan, and thank you! What an interesting question. I think this may be to do with coating the exterior of the amardin to keep the wrap from sticking to it too much; I don’t think the oil is needed in the making of the fruit leather. Amy, absolutely you can use those apricots. They’ll be great, and I never peel them. Do the apricots need to be peeled? Hi Amy–nope, just leave them on–the skins add wonderful flavor! Wonderful, trying this out as we speak! I found your site while looking for an Apricot “fruit leather” recipe and then I saw you were a fellow Michigander so I subscribed! Can’t wait to check out the rest of your site….thanks for the Apricot ideas! Welcome Kathy! Sounds like you love apricot as much as I do!! Enjoy the fruit leather! I’ve made this recipe a number of times now. My family loves it as much as I do. Definitely best with fresh apricots but that can be hard to find in Minnesota during the winter. I’ve made it with jarred apricots and while it’s not as good as using fresh it still tastes pretty good. A little bit of sunshine in the cold. 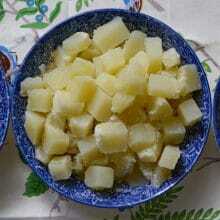 We generally have to make a double batch so there is some hope of having some left for the next day. Yum! Thanks for sharing the recipe. Thank you Courtney–I’m glad to know that this works with jarred apricots! Will have to try that in these off-seasons! Oh my God, imagine how surprised I was, am, to see the Ameerdeen. I remember when I was a very little girl in Alexandria, Egypt, I used to love eating it, I was given this from 3-4 years old. I was born in Alexandria, my dad was stationed in Alexandria for the British Admiralty and we were them for 6-1/2 years and then we had to leave there cause trouble was a brewing and we were called back to Malta. My dad was Maltese. When we went to Malta we were looking for it, but could not find it. Up until now I love it, but buying from Middle eastern stores they charge you an arm and a leg for it. Now that I have the recipe, I will definitely try it. See Apricot are my favourite fruit, or rather one of my favorite fruits. I do like all fruits, I might try it with peaches too, when in season which is the summer. Hey Maureen, we were in Lebanon last year visiting homes to learn traditional and we took a lot of photos at the souk el tayeb, the fruit leathers being one of them. We were searching for the name and came upon your post. What an amazing blog you have!! We love Lebanese food and Leila (my partner) is Lebanese so we cook the second best food in the world (behind Italian, my nationality) all the time!! Thanks to your post we now know the aberdeen name!! 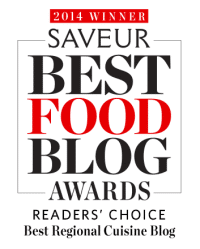 We would love to meet you and cook with you one day!! Thanks again. This is terrific! Thanks so much you two! I absolutely love this fruit leather–grew up on it! I was born in Lebanon and am Armenian. I grew up with Lebanese and Armenian food. I don’t cook enough of either cuisines and should do that more! I love your blog and will definitely make something soon!